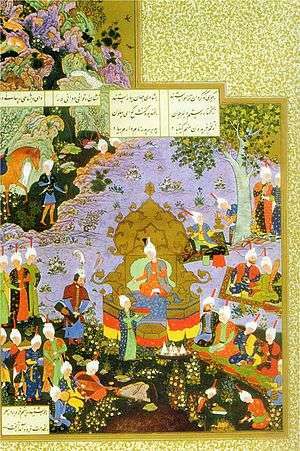 The Yādegār-e Zarirān [jɒːdeˈɡɒːɾe zæɾiːɾˈɒːn] (Persian: یادگار زریران‎‎) or Ayādgār ī Zarērān (English: "Memorial of Zarēr"), is a short Middle Persian (Pahlavi) text of ancient Iranian epic poetry. The story is preserved in a unique manuscript written in AD 1322. The Avesta mentions the struggle of Vištāspa and Zairivairi (whose name became later known as “Zarēr”) against the “wicked Arəǰat.aspa” (Yašt 5.108, 112, 117, cf. Yašt 19.87) and establish the antiquity of this story of “Wištāsp’s battle”. According to the Iranologist Mary Boyce: the Ayādgār ī Zarērān retains the conventions of heroic epic, with rich hyperbole, fixed epithets, and an abundance of similes and formal repetitions. It thus attests, in both subject-matter and treatment, the long cultivation of Iranian minstrel poetry. The story celebrates an event of early history in the Zoroastrian faith. 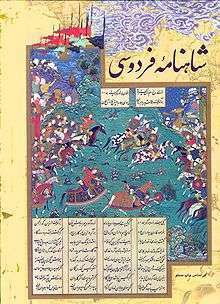 It tells the tale of the old religious wars of Zoroaster's time, and recounts the heroic deeds of a champion named Zarēr. 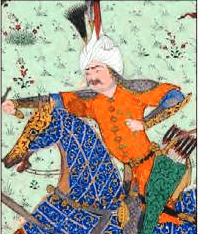 This hero is also mentioned in Shahnameh of Ferdowsi. King Wishtasp, who accepted the “pure religion of the Mazda-worshippers” (dēn ī abēzag ī māzdesnān), is sent a messenger by king Arjasp, the king of the Hyons. Jamasp, minister of Wishtasp, predicts that Zarir, brother of Wishtasp, and many of the kins of Wishtasp will be martyred in the future battle. When the battle occurs, Zarir fights heroically, but is slain by a foul Hyon by the name of Widrafš i Jadu "Wīdrafš the sorcerer". But the son of Zarir, Bastwar, despite being forbidden to battle by his uncle Wištāsp, goes to the battle field and finds his father's body. Bastwar afterwards joins the battle and slays many Hyōns in revenge. He also obtains revenge for his father's death and shoots an arrow through Wīdrafš’ heart. Then, the cousin of Bastwar, the hero Spandyād (In the Shahnameh Esfandyar), the son of Wištāsp, ends the battle by capturing Arǰāsp, mutilating him, and sending him abject away on a donkey whose tail was cut. A modern play based on the story was written by Qotb al-Din Sadeqi with casts including Mostafa Abdollahi, Kazem Hozhir-Azad, Esmayil Bakhtiyari and others. This article is issued from Wikipedia - version of the 2/13/2014. The text is available under the Creative Commons Attribution/Share Alike but additional terms may apply for the media files.